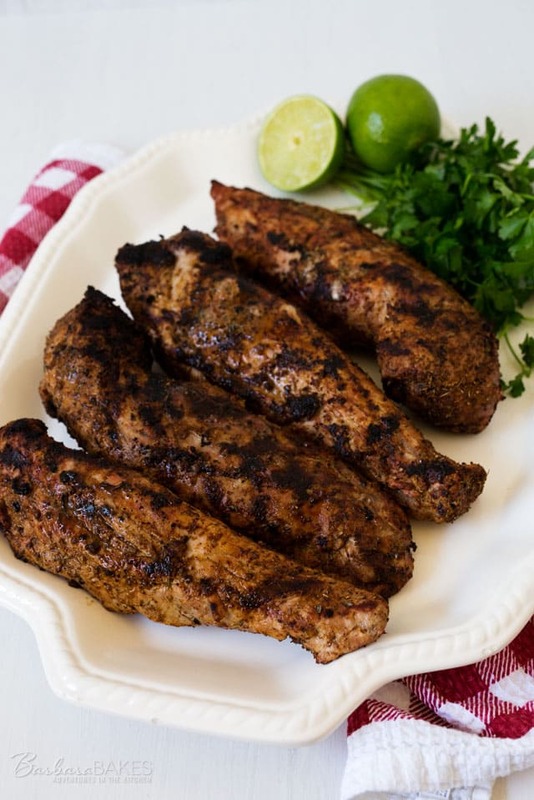 This Spicy Grilled Pork Tenderloin is a family favorite. It’s has a great flavor and is always tender and juicy. Lately I’ve been cooking a lot of pork tenderloin. It’s fairly cheap, cooks up quick and easy, and is so tender, juicy and delicious. It also comes in a pack with two tenderloins, so I can usually make two meals from it. The Salt Lake Tribune recently printed Cathie Mooers’ Grilled Pork Tenderloins with Grilled Strawberry Salsa recipe. I wasn’t brave enough to make the grilled salsa (my husband complains about grilled pineapple), but the spicy tenderloin recipe sounded quick and delicious, and it was! Because of the rub, the tenderloins browned darker than I normally like, but it did not have a burnt flavor, just a wonderful spicy smokey flavor. We ate one tenderloin and I diced the other tenderloin and will used it to make Lynda’s Southwestern (Chicken) Pork and Rice Skillet Dinner. Update 5/2/2016 – This is a family favorite recipe. When I made it recently for a family get together, I took some new photos. Since I was feeding my extended family. I doubled the recipe. Here’s my slightly modified version of the tenderloin recipe. Rub pork tenderloins with oil. Drizzle with lime juice. Combine dried spices in a bowl and then sprinkle evenly on tenderloins. Grill, turning occasionally, until well browned on all sides, about 10 minutes. Reduce temperature to low and cover with grill lid. Continued to cook pork covered, until an instant-read thermometer inserted into the center registers 145 degrees, turning occasionally. Update: This is a really versatile recipe, you can change up the spices. I like to use lemon pepper and lots of fresh ground pepper. You can also brown it on the stove and then bake it in the oven until it reaches 145 - 160 degrees if you want it well done. What a great flavor combo! I love oregano with pork! I can hear something grilling on my kitchen. Yes. 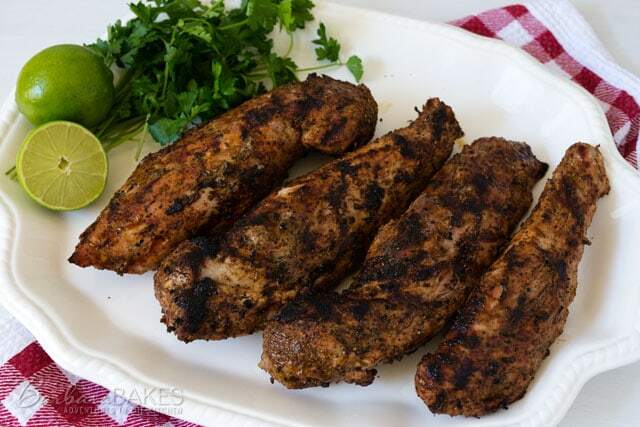 It’s this yummy spicy grilled pork tenderloin! Those look and sound great, Barbara. I buy pork tenderloin a lot too-it never lets me down with how tender it is-and it’s a quick cook too. We don’t grill them often-I usually brown them on my grill pan then bake in the oven like you mentioned for an alternate cooking method. I had to go peek at the strawberry salsa-bet it would be good without grilling the strawberries..although that does sound interesting. Bob isn’t a pineapple lover so he’d be siding with your husband. 🙂 I make a lot of fruit salsas to serve with pork and chicken-they really add a lot. If I try grilling the berries, I’ll let you know how they turn out. Delicious! A great spice mix. This looks delicious. I have a great tender loin, but it's getting over used, I'm trying yours out tonight. Thanks for this new idea. Yum! I don't have a bbq, but I'm sure baking it would be amazing too! Oh, my husband would love it if I made this for dinner. That pork tenderloin looks great, and the recipe sounds delicious! I just made pork tenderloin yesterday and it was really good! The flavors of this one sound great. I'll have to make this one next. My husband would love the spicy! Yummm. This looks so good. I almost always cook my pork tenderloins on the grill. The leftovers make great sandwiches. I like your seasonings. I've never had grilled pork tenderloin but it's so good roasted that I can just imagine how much better it is on the grill! Love the rub & how good it looks. Perfecto!! Pork tenderloin on the grill is one of my favorites. Yours look perfect to me. I just stocked up on meat at Costco, including a package of pork tenderloin! I can't wait to try this rub! Believe it or not I've only made the pre-marinated pork tenderloins before. But we love to grill and this rub sounds great. I think I need to pick up some pork tenderloin soon.